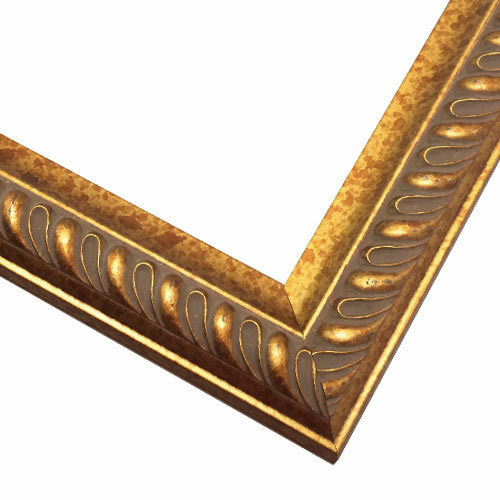 A rounded, antiqued gold picture frame with a subtle patina wash. The elegant raised patterns and smooth satiny finish make this genuine wood frame perfect as a document frame or to accent art and photography of all kinds. I can't believe the quality, and service and value we received. I took a picture off my phone from Italy, loaded it and now I have a work of art that every one would love. Added this as an outer frame on an existing framed artwork The result was beautiful! Excellent frames, every every bit of what you looking for. I've been a customer for many years and and happy I found you again. This frame was perfect and I couldn't be happier not only with the color and design, but the outstanding value. Excellent craftsmanship! Will continue buying from picturefame.com as the price is right! I'm impressed with the quality of this frame (I ordered 3). Very pleased with the hardware and the non-glare plexi-glass as well. In summary, very good value for the money. Will definitely order from pictureframes.com again. Well made, what I ordered. I do wish I'd ordered a wider frame but that is on me. Price, quality style looked great with my art! It best suits and compliments the painting. 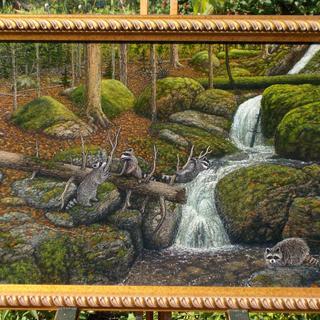 Traditional style and frame colors highlight oil painting. ITS VERY SIMILAR TO WHAT A NEEDED TO MATCH UP. Good Setting for a pair of prints I purchased in England some time ago. Dealt with you folks for many years and have never had a problem. Good product; good quality work and perfect sizing. It closely resembled and complimented frames in my house. The elegance of the finish and profile compliments my artwork. Beautiful frame...and at a great price! the style went with our picture we are going to place in it. Great frame at a great price... and the customer service is the best, bar none! I paint marines mostly so a lot of blue. The gold looks nice against the blue. It also looks a little like a rope which looks nautical. BEST ANSWER: Hello! Thank you for contacting us! We apologize for the oversight with having two depths listed with the frame. The actual depth of the frame is 3/8". We are making the correction to the website to reflect the correct depth of 3/8". If you have any additional questions, please let me know. Happy Framing! is the uv protective acrylic non reflective? BEST ANSWER: Hello Francis! Thank you for your inquiry. The UV Protectant acrylic is not non reflective, but instead protects the image from the sunlight. Our Non Glare Acrylic is available and serves the purpose of anti glare only. At this time, we do not have an acrylic that serves dual purposes. If you have any further questions, please let us know. Have a great day! In the detail section of the description it has 2 different measurements for the width of the frame. 1 1/4 and 2 1/2. Which is correct? BEST ANSWER: We apologize that the width of the frame was not properly displayed. The frame has a width of 1 3/16". I will have our web team make the correct to the website. Thanks. How does a liner affect the size of the opening? If I order an 8x10 frame with a linen liner, does the opening become smaller. If so, by how much?